This pleached Pyrus calleryana 'Chanticleer' is fantastic for providing changing seasonal interest and creating privacy. In April-May, a glorious mass of white flowers stand out against the glossy green foliage, which in turn takes on colourful reds and oranges in autumn. 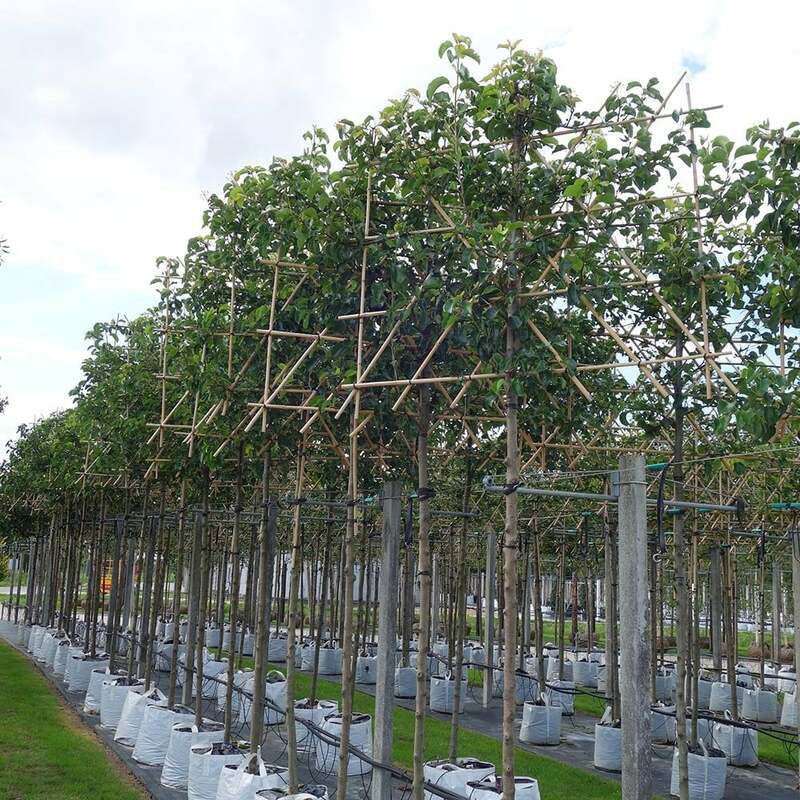 Our stunning pleached Ornamental Pear trees have been carefully and expertly trained over a number of years to create beautiful screening trees. The grand looking trees produced by this method of training are sometimes known as hedging in the sky or stilt hedging. Please note: Our containerised Pleached trees are available year-round, whereas rootball forms may be available for delivery between October and April/May. Please call our Sales and Service team on 01943 660870 to discuss requirements. When planting pleached Pyrus, prepare the planting area by removing all weeds and grass within a metre of your desired planting hole. Dig a square hole as deep as your root mass and approximately 2x as wide. To help the tree establish more effectively, we recommend sprinkling root grow in the hole. It is a two person job (minimum) to place the rootball in the hole. Then, using 50% of the original soil and 50% compost, fill in the hole and firm around gently. Avoid banking it up around the collar of the tree. Plant pleached trees with a large stake and tie kit - instructions are in the online planting guide. Formative pruning has already been carefully and expertly carried out on all our pleached trees including this ornamental pear. You will just need to carry out maintenance pruning going forwards by removing any diseased or damaged branches and pruning to maintain the shape of the tree.